The Red Sox are finally ready to face reality. That reality is that they need an overhaul to rebuild the team into a contender. The Red Sox had been ridding the spending train for a long time now. They won 2 world series titles in the last 8 years while spending crazy money. This year will be the 3rd year in a row the Sox will not make the playoffs. The Red Sox currently have a record of 60-66 and are 13.5 games back in the American League East. The Red Sox and the Los Angeles Dodgers are set to make a blockbuster trade at a time of the season you usually never see trades happen. The deal would have the Dodgers receiving Adrian Gonzalez, Carl Crawford, Josh Beckett and Nick Punto. While the Red Sox would receive the Dodgers top pitching prospects Allen Webster and Rubby De La Rosa, offensive prospects Jerry Sands and Ivan DeJesus and current Major Leaguer James Loney. The deal would free up a tremendous amount of money for the Red Sox, $262.5 million to be exact. It would be a record contract dump trade. It has been rumored as of Saturday that the Red Sox might be reconsidering giving up Adrian Gonzalez in the deal. Gonzalez has been the best performing of the players that could go to L.A. The Dodgers will be more accepting of a trade that includes Gonzalez. The Red Sox would have no problem letting go of Carl Crawford who the team sign right before the start of the 2011 season. Crawford had been a great star in Tampa Bay and the Sox gave him a 7 year $142 million contract. Crawford had career low numbers in the 2011 season and has only played 31 games this year due to injury. Josh Beckett is another star who’s time has come to go for Boston. Beckett once was the best pitchers in the Majors but has now become a pitcher who might get you a win if your lucky. Beckett has only won 1 game in his last 13 starts and appears to be on the decline in his career. Its surprising but that is how things appear for Beckett still not at the dreaded 38 years of age where most pitchers fall off. The Dodgers are ready to play big money ball and do it like other teams in their market have. The Dodgers are a really good team and are only 3 games back from 1st in the National League West. The Dodgers will be hoping that the change of scenery will benefit the players they will acquire from the Red Sox. 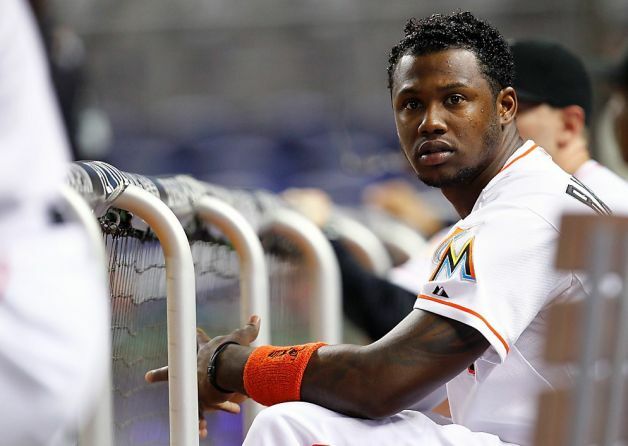 It likely could, it has worked for Hanley Ramirez who they recently required from the Miami Marlins. The Dodgers are getting ready for September and a chase for the playoffs. They look like a team that is going to be a strong contender if they make the playoffs. Where do the Red Sox go from here? That is an easy question to answer, they go for the free agents available in the off season and develop their prospects. With all of the freed up money they can pursue impact players that can start their franchise back on track towards the playoffs. The team has a recent history of signing top free agents and this deal allows them to do it again in a way that has brought them success. It is time for a fresh start for the Sox. The prospects they would land in this deal would help their future just as much if not more than possible free agents. Both teams have until the early afternoon on Sunday to finalize this deal. It is very likely this deal will go down and when it does it will make history. How much this deal will effect both franchises is the most interesting part of this deal. While the Dodgers could get a boost now while the Sox might be setting up a bright future in this trade. Only time will tell how this story of the August blockbuster trade will end up. The Miami Marlins came into Saturday nights game against the Cincinnati Reds, off of two loses to start the season. There was question of where the offensive power and speed that the team has been built to have was. It showed up Saturday against the Reds in a 8-3 victory. The club received three home runs from Omar Infante, Hanley Ramirez and John Buck. The starting pitching for the Marlins has been tremendous, but Ricky Nolasco was the first of the starting pitchers to win a game for the ball club so far. The Reds offense was alive but not as much as the Marlins. The Reds Zack Cozart had a triple and hit a homer in the teams loosing effort. It was nice to see the Marlins get their first win this season. This should be a season to remember with the new ballpark, new manager and high paid free agents. The NL East is tougher than ever this year. The Phillies will still be bringing great pitching and offense. The Braves have staying power to be in the division race going into September. The Nationals have the makings of a strong team possibly the best they have fielded since their inception. But the Mets will probably stay in the cellar even though David Wright should have another All Star season. I still have the beief that the Marlins can take the division for the first time in franchise history. 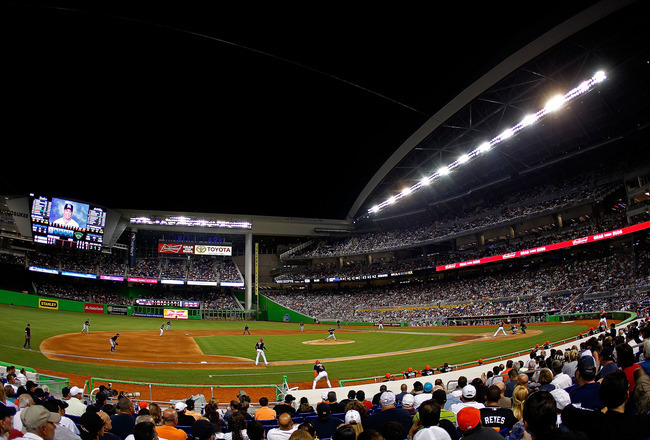 The Marlins will be taking on the Reds in the final game of the series on Sunday. The Reds will be sending Bronson Arroyo to the mound and the Marlins will be sending Carlos Zambrano. It will be interesting to see how Zambrano will do this season and if he can keep from going insane like he has the past few seasons with the Cubs. Ozzie Guillen has stated during Spring Training that he will be able to control Zambrano which made many people laugh. Sundays game starts at 1pm and should be as exciting as Saturdays game. 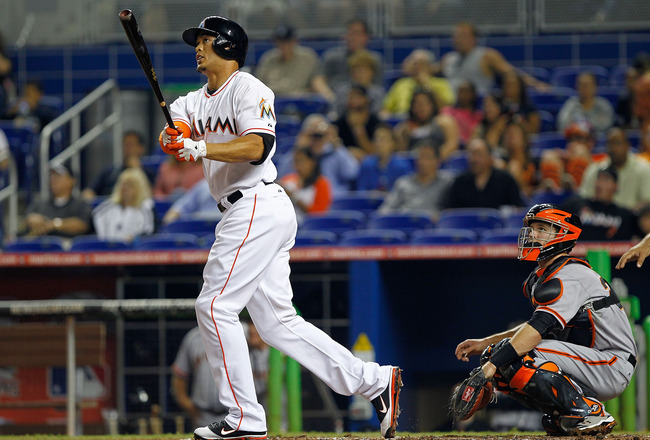 Miami Marlins – Where is the Offense? Rough couple of games for the fish. The biggest story up to this point of opening week has to be the story of the Miami Marlins and their lack of offense. They opened up their new stadium to much fanfare on Wednesday night, in a 4-1 loosing effort to the St. Louis Cardinals. The Marlins Ace Josh Johnson pitched well but not up to the level that is expected of this potential Cy Young pitcher. The reigning World Series MVP David Freese was the star of this game with 3 hits and 2 RBI’s in 5 visits to the plate. The Marlins then traveled to Cincinnati to play the Reds yesterday and loss 4-0. The Marlins new pitcher Mark Buehrle had a good outing but did not have the offense behind him to have any chance of succeeding in this game. Cincinnati dominated with the pitching of Cueto and the offensive power of players like Jay Bruce. The bottom line after two games is that the Marlins offense has sucked! The entire team is batting below .200. The pitching is good but the team can’t succeed without the offense they are supposed to have. Hanley Ramirez and Mike Stanton have been the two biggest problems on offense so far. Neither player have reached base off a hit in a combined 16 plate appearances. They need to get it together quick or the team will be fighting to get back in the standings before April is over. They have Friday off and will certainly be gathering themselves to play the Reds again on Saturday. The team has finally garnered the attention of the nation and has opened up like the Marlins of old. Time is precious and this team could get down in the dumps really quick. I feel the Marlins need to snap out of this 2 game slump and play like the playoff contenders they are. All of that money spent on free agents and new manager needs to be redeemed with wins. The wins must start Saturday night!